Delicious and nutritious pasta and chickpea soup is a classic in Tuscany and other Central and Southern regions of Italy. However, each region has its own way of making it! Minestra di Pasta e Ceci alla Toscana. Pasta and chickpeas is a traditional pasta recipe in many parts of Central and Southern Italy. Most recipes are more of a soup, but others are ‘dry’. Italians say pasta ‘asciutta’. What this means is the pasta is served with a sauce but isn’t a soup. In Italy, pasta and chickpea soup is called a ‘minestra’. Italians actually have six different kinds of vegetable soup; minestra, minestrone, zuppa, passato, vellutata and crema! The word ‘minestra’ comes from the verb minestrare or amministrare, meaning to administer. Apparently because traditionally this soup was served at the table by the head of the family! A minestra usually contains vegetables or legumes along with some kind of cereal such as rice, pasta, farro, barley etc. Like pasta with chickpea soup, minestrone contains vegetables and pasta and rice. However, I read that the recipe is more modern and includes quite a number of veggies which weren’t widely available or eaten in Italy until the 17th-18th century. Having said that, nowadays, minestra can also contain ingredients that wouldn’t have been used a long time ago, like tomatoes. Classic minestrone is also usually thicker than a minestra and made using green, red and yellow veggies. Today, it is made with fresh and seasonal vegetables. But, in the past it was a way to use up not exactly fresh vegetables or those that become more easily digestible after a long cooking time. Zuppa is a soup without pasta or cereal and usually eaten with bread or croutons. Passato is a puree of mixed vegetables, often seasonal, whereas vellutata is a puree of normally only 2 or 3 vegetables to which cream may be added. Finally crema, as you may imagine is a puree too. But, this soup is usually made with one type of vegetable and may include milk or rice flour. Pasta with chickpea soup is good for you! Pasta with chickpeas is a recipe with very ancient origins some versions of which date back to Ancient Rome! It is also a dish that was popular in the past among the peasant farming population because of its low cost but high nutrient content. In fact, chickpeas, like all other legumes, possess a high quantity of protein. Today, chickpeas are considered a super food and are full of protein, fibre, minerals and vitamins. So, the combination of chickpeas with the carbohydrates contained in the pasta, makes pasta and chickpea soup super nutritious and a great source of energy! Perfect for the farmers working all day in the fields! Different versions of pasta with chickpea soup. This version of pasta and chickpea soup is from Tuscany. 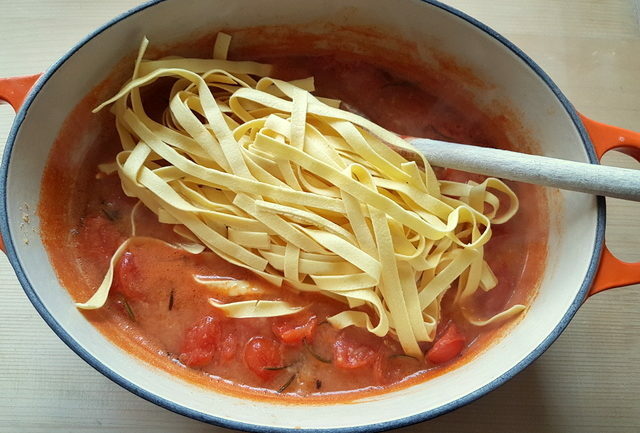 There, the pasta is very often egg pasta like tagliatelle or tagliolini and is cooked in the soup just before serving. 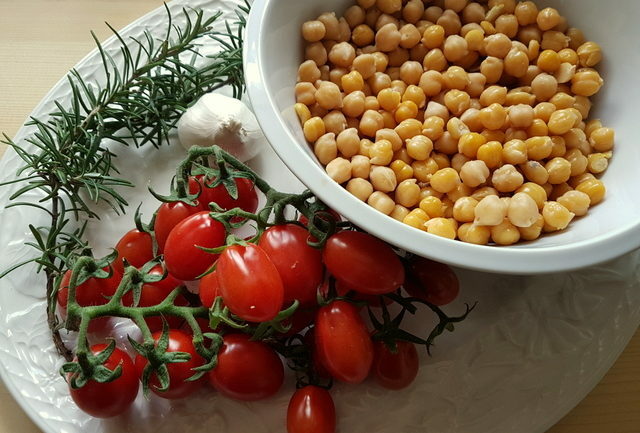 The other ingredients apart from the chickpeas are just some garlic, rosemary and tomatoes or tomato concentrate. So very simple. 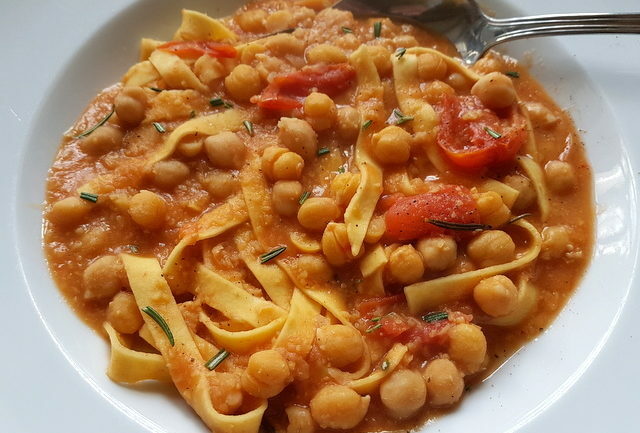 Other well-known versions for pasta with chickpea soup come from Puglia, Naples and Rome. In Campania (Naples) the pasta is usually some kind of pasta tube such as broken ziti or even candele. The Neapolitans don’t use rosemary but more often basil or parsley and frequently add peperoncino! In Lazio, Roman pasta and chickpea soup is enriched with salted anchovies. These are fried separately with a clove of garlic and tomato sauce then added it to rest of the soup. The pasta in Rome is often small tubes like ditalini. 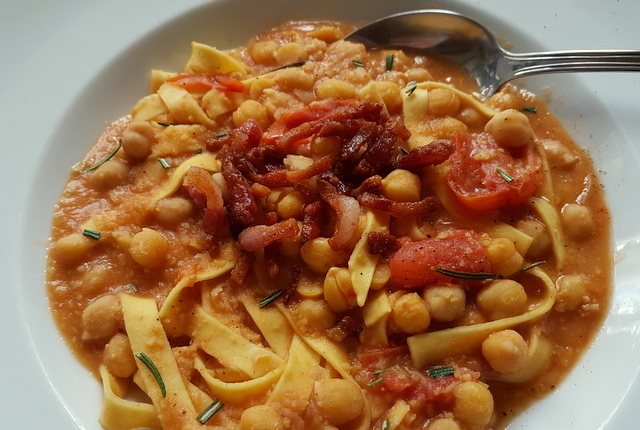 In Puglia, pasta with chickpeas is not so much a soup and the pasta is usually cooked separately. 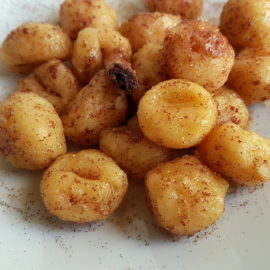 They use short pasta or lagane like in this recipe for lagane pasta and chickpeas from Basilicata. A very ancient recipe from Tuscany which I would like to try is with the addition of chestnuts to pasta and chickpea soup. These are first chopped and sautéed with red garlic, rosemary and a handful of fine chopped pork fat. Making this pasta with chickpea soup. 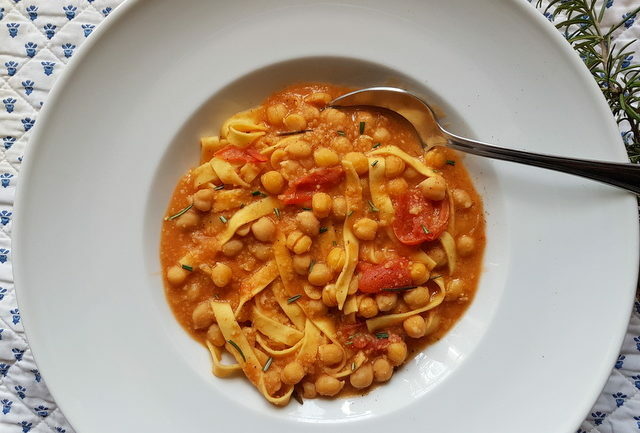 Although more of a cold weather dish, this pasta with chickpea soup from Tuscany can, of course, be eaten year round. In Italy, it is normally made with dried chickpeas which have been soaked overnight. This is because the chickpea cooking water is the soup! Obviously this means it takes a while to make. Chickpeas have to be cooked for up to 2 hours depending on their size! You can add crispy fried guanciale or pancetta. 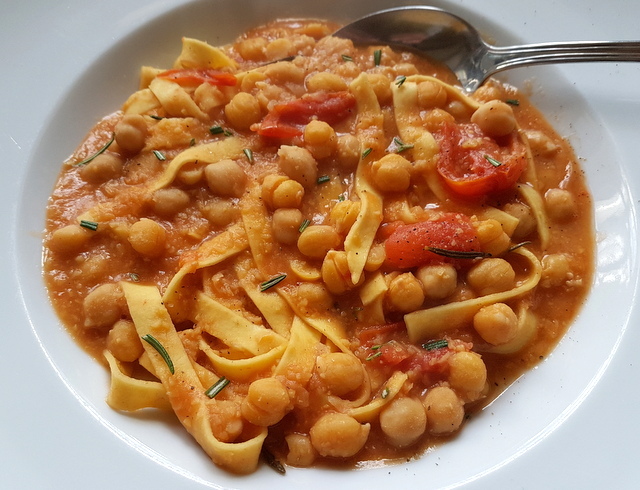 Pasta with chickpea soup can be made with canned chickpeas and stock. But I don’t think it tastes the same. I also don’t like using canned chickpeas because they are higher in sodium and fat and lower in protein, minerals and vitamins per serving compared to dried chickpeas. I’m sure that if you try this soup, you’ll agree it’s worth the time it takes to make! For added flavour, you can also add some crispy guanciale or pancetta. 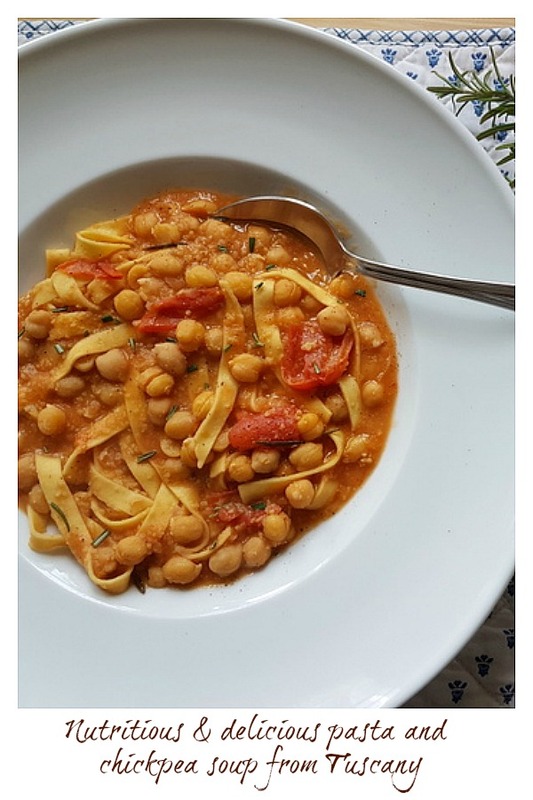 If you do try this pasta with chickpea soup recipe, I’d love to hear what you think. Please write a comment here on the blog or post a comment on the Pasta Project Facebook page. 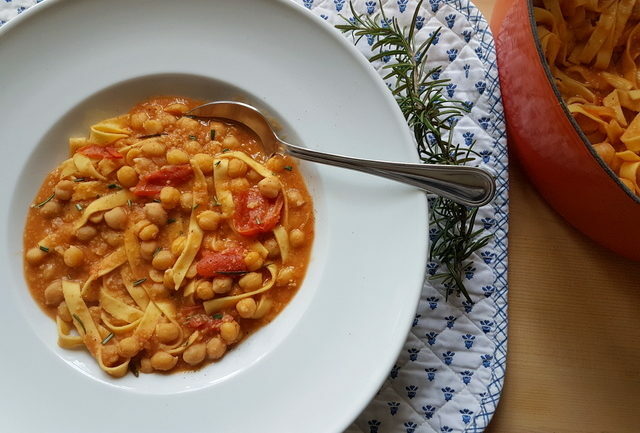 This classic pasta and chickpea soup from Tuscany is very nutritious and healthy. The ingredients are few and simple. Great Italian comfort food in a bowl! Start preparing the day before by soaking the chickpeas in a large bowl with plenty of warm water. Let them soak for a whole night. Drain them, put them in a saucepan with about two liters of water, bring to a boil and cook covered, on a low heat for about 2-3 hours, or at least until they are tender. 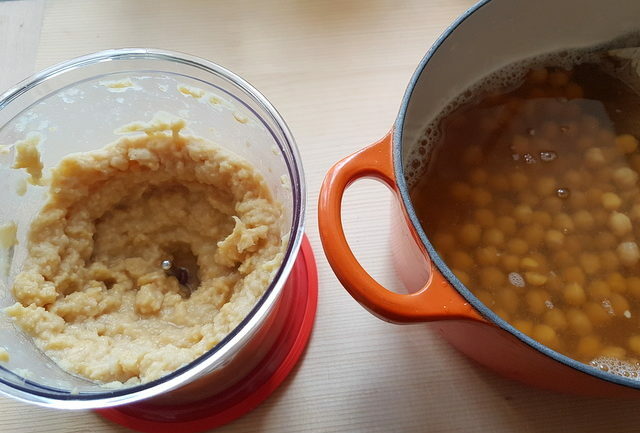 About 2/3 of the way through cooking, remove three ladles of chickpeas with a little water, blend them until you have a rough puree and then put the pureed chickpeas back into the pot. 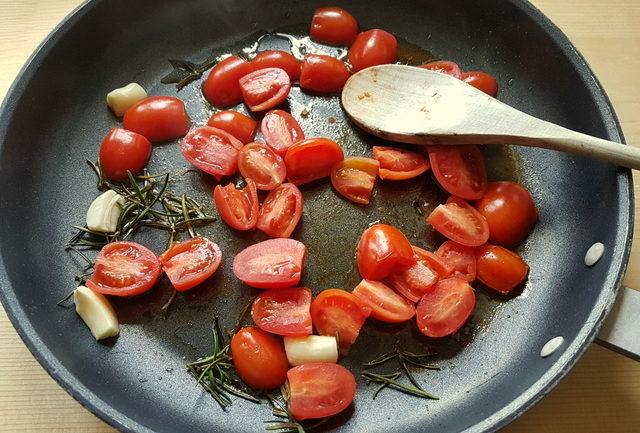 Next, heat the olive oil in a pan with the garlic cloves and rosemary, then add the chopped tomatoes. Cook for about ten minutes, remove the garlic and pour this sauce into the pot with the chickpeas. Add salt, if necessary, and let the cooking continue until the chickpeas are ready. Add the pasta to the chickpea soup and cook for the amount of time stated on the packet. Fresh tagliatelle only take 1-2 minutes! Some people break the pasta into smaller pieces. I didn’t. Serve immediately with a sprinkling of extra virgin olive oil, grated cheese (if required) and ground black pepper. You can also add some crispy fried guanciale or pancetta! This looks delicious and easy to make! I might have to make a batch of this in the coming days for lunch! Will let you know how it goes. I love how each region has their own way of making pasta. I am sure there are many other recipes that vary throughout different regions, too. Delicious soup from a very beautiful area! I have read so many great things about Tuscany, and now I can see that it also has some amazing food! Delicious pasta and chickpea soup! Such an interesting post. When I’ve made pasta e ceci, I’ve used tube pasta. I can’t wait to try your version, I know my husband will enjoy it. This sounds such a hearty dish with both the chickpeas and pasta, but it looks so comforting and tasty too. I do love chickpeas so much! I would try this recipe with gluten-free pasta for sure! Love all of the flavors in this dish! I’ve never tried a recipe that used chickpeas with pasta but this sounds so tasty. It would make a lovely hearty pasta soup. I always associate chickpeas with North African or Indian food and often forget how much they are used in classic European food, this looks and sounds delicious. Looking forward to giving this a try. I love the idea of putting chickpeas and pasta together! 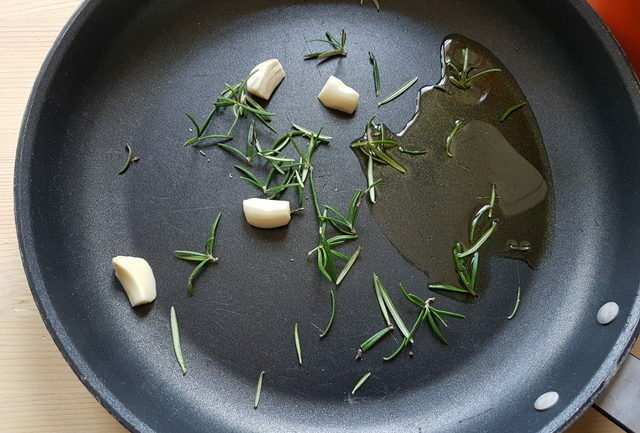 It sounds like such a delicious match, especially with the rosemary. Thanks for sharing! Pasta with chickpeas is a whole new ball game for me. I love your version. It was very filling for my family. A complete meal. Served it with a salad. 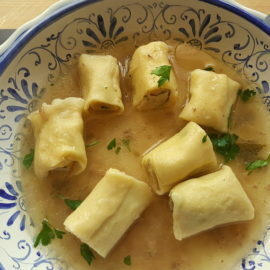 This soup transports me back to my favourite parts of Tuscany for sure! Love this great recipe. I have never tried this combo before. What a lovely pairing of flavors! Will try it asap, thanks for the wonderful recipe. 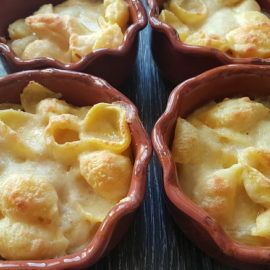 I love this recipe – it’s like one I used to make all the time! 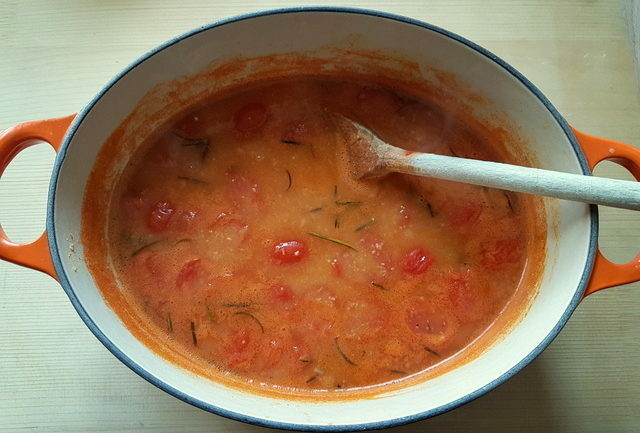 The chickpeas, tomato and rosemary all taste so delicious together! i am always looking for new delicious soup recipes! We eat them almost every day! This soup is so full of flavor! The chickpeas are an absolutely awesome addition to the soup! Pasta and chickpeas is such a great combination! What amazing flavor in this- I can’t wait to try it. This soup looks so hearty and delicious! I have not tried something like this before, and this looks so so so good. I can’t wait to give it a try. I would love to try this one! It looks pretty easy too, which is always a bonus, but not a requirement 🙂 I love using chickpeas, but I don’t think I’ve ever had them with pasta, that sounds delicious. what a great soup! i love chickpeas but haven’t really used them with pasta before. this looks like an ultra flavorful comforting dish! Nothing beats homemade soup. It is SPRING and it is SNOWING!! This would be perfect for dinner tonight. I have all the ingredients too. This looks and sounds amazing!! I can’t wait to try this. Love that this is a healthier dish without sacrificing any of the flavor. Looks fantastic! I’m a big fan of chickpeas so this pasta dish is calling my name. Can’t wait to try. I learn so much when I read your posts. This soup looks delicious! What a great flavor combination! Chickpeas for the win, thanks for the share we loved it! I’ve never cooked chickpeas before but I’m excited to try something new. As always I enjoy reading the facts about the food you cook.